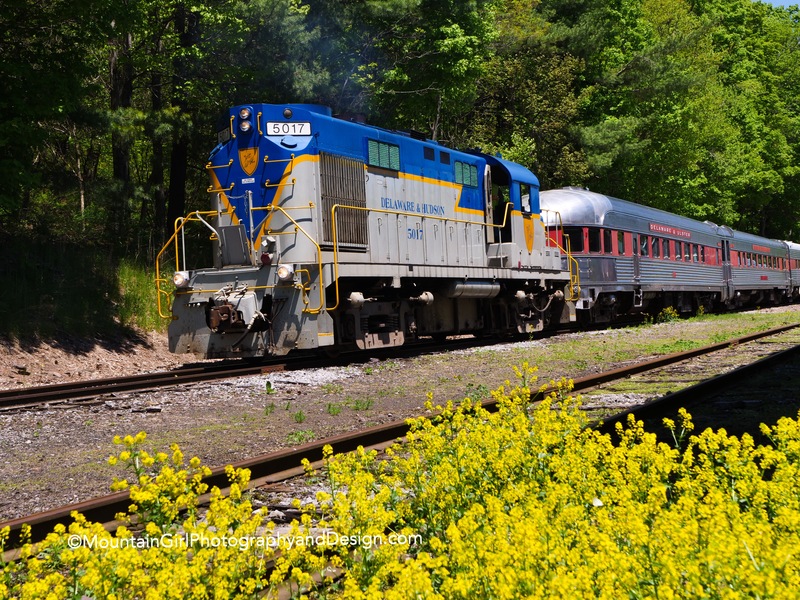 With CMRR’s Great Train Robbery event, DURR’s first Rip Van Winkle charter run of the season and the new Rail Explorers USA opening weekend in Phoenicia, both Ulster and Delaware Counties proudly demonstrate to visitors the rails are the place to be this holiday weekend. DURR Rip Van Winkle Flyer charter run on Thursday, May 24. In Delaware County, although the official opening weekend was held up due to weather induced track repair, Delaware and Ulster Railroad (DURR) ran its first revenue train of the season, a private charter. Folks were all smiles on the beautiful 75 degree Thursday as they gently rocked through the mountains on the the Rip Van Winkle Flyer. A round trip from Arkville to Roxbury and back passes through the quaint hamlet of Halcottsville and provides passengers with bucolic views of Wawaka Lake, the Round Barn and several farms along the way. The Ben Rounds Band will be waiting for you as you break along the way, playing their recognizable mix of country and rock covers. Ben is a major supporter of saving the rails in Ulster County and has played several fundraisers contributing to the cause, and his music never disappoints! If you have a little more coin, and energy, you can ride the new Rail Explorers USA rail bikes through scenic Ulster County. Boarding takes place at the historic Phoenicia station, aka the Empire State Railroad Museum. 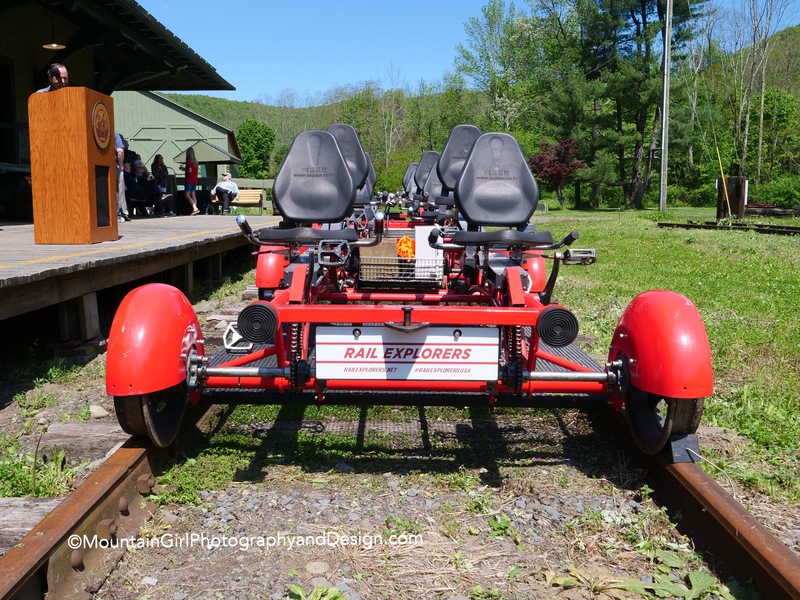 Rail bikes lined up for their inaugural run following the Rail Explorers USA Catskill Division Ceremony this past Wednesday. Please ask permission for photo usage. In fact, trail without rail advocates, UC politicians Mike Hein and Kathy Nolan, who some consider to be the driving force behind the currently segmented (interrupted, compromised, decimated, however you choose to view it) rail line, stood on this hallowed ground on Wednesday during the ribbon cutting ceremony for Rail Explorers. Paul LaPierre, on the board of the ESRM*, in an unexpected gesture, wholeheartedly welcomed them, thanking Ulster County for its assistance in cleaning up the museam property and for the promise of a permit to keep equipment and cars on the property for repair and display purposes. My point is, if you miss riding along the mighty Esopus, as the CMRR has not been able to operate there since the loss of their lease in 2016, you can still do an eight mile round trip pedal through Mt. Tremper, across Rt. 28, stopping just a mile shy of where the tracks now end. Bring plenty of water and snacks. The beautiful tour, though electric motor assisted on the way back, is still a workout, so eat your wheaties! Bring your rain gear too, as Rail Explorers operates in mild to moderately inclement weather. Please stay tuned for full, objective coverage of the Rail Explorers USA Ribbon Ceremony. In the meantime, enjoy this weekend safely, be thankful for every moment given to you and those you love, never forgetting the price paid by those who fight for our country, and their families. *Please note a previous version of this article referred to Paul LaPierre as “head of the ESRM”. He has since brought to attention he is only a member of its board. are 30 plus inches in the city. Life just is not fair. if you are pining for snow. A sweet New York Catskill Mountain slideshow video highlights waterfalls, moon-scapes and snow-scapes, set to Ben Rounds‘ rendition of ‘Silent Night’, for all the fans and supporters of Mountain Girl Photography & Design. The local music movement depends on small businesses working together. Its a symbiotic relationship. The bar in town hires the band. The band hires a promoter/photographer/blogger. Its a busy night (as a result of the crowd-pleasing band being there) so the wait staff does well on tips. The audience is impressed, someone grabs a business card, checks out the website, and hires the band for their next event. The following is an example of how this all works: A local favorite, the Ben Rounds Band, was hired by a local venue. A photographer (me) put together the promotion of the event, and proceeded to video the 1st set. Next, an exciting new collaboration between the promoter (me) i.e. (Mountain Girl Photography & Design) and Fred Cristiani, aka bass player for B.R.B. then led to the latest production by MGP&D…a band booking demo complete with a fun time-lapse. Next, an employee of a local business hired the band for their upcoming outdoor celebration. So do yourself, your favorite local band, and your community a favor: watch and share this booking demo, hire local bands, or at least support them at their gigs. Show appreciation by tipping the band, and keep them in mind the next time you want to hire entertainment. You will be supporting not just the local music scene, but local artists who specialize in the promotion of music, local restaurants, and everyone in between. Keep the local music scene alive! Watch the fun “My Dog LiL” video that chronicles the day of a three-legged Jack Russell Terrier!